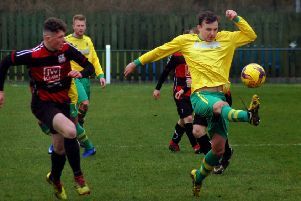 Asfordby FC secured a vital three points in their battle attempts to climb out of Senior League Premier bottom three on Saturday. Lee Mann’s side travelled to fourth-bottom Allexton who sat 11 points and two places higher than Asfordby at kick-off. Defeat would have all but sealed their fate and the visitors trailed at half-time, but showed character to score three second-half goals and complete a 3-2 win on the 3G. Mann said: “I thought, given the conditions, we played some really good football again today, and deserved the three points. “We managed the game better this week compared to others, and overall every one of the lads played their part. Going up against the galeforce winds in the first half, slack marking and defending allowed the hosts to break through for the opening goal. But crucial saves from Lewis Spencer when the game was tight kept the visitors in touch at 1-0 going into half-time. Asfordby kept up their passing game in the second half and used the ball well, with Ben Lapworth and Kieron Clayton dominating midfield. Jamie Felstead and Tom Atherley caused plenty of problems on the flanks for Allexton’s back line. And it was Felstead who drew Asfordby level, slotting in a deserved goal after turning his man inside out. The game opened up as both teams pressed for the lead, but it was the visitors who struck next when John Love got his head to a great cross. Asfordby showed their vulnerability to give Allexton an equaliser and let them back in the game. The game remained open, with Spencer making another great save before Asfordby grabbed the winner. Jake Dawkin, making his debut from the substitutes bench, headed in following a tantalising free-kick from Alex Johnson. This time, Asfordby managed to see the game out relatively unscathed. “Overall, I was really pleased to get the win that the lads totally deserved,” Mann added. 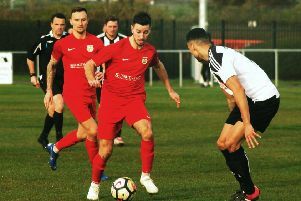 Due largely to their six-point deduction earlier in the season, hopes of escaping the bottom three still appear slim, but a heavy midweek defeat for Allexton to the bottom side left Asfordby eight points adrift with a game in hand. They begin their five-game run-in with a big test at home to fourth-placed Thurnby Rangers on Saturday (kick-off 3pm). Asfordby: Spencer, S. Wright, A. Wright, L. Hollis, Ridout (c), Lapworth, Atherley, Clayton, Johnson, Love, Felstead, Dawkin, Weller, Mann.